Mesklin, upon which the entirety of the narrative of Hal Clement's 1954 entry to the SF Masterworks series takes place, is a planet remarkable for its methane-saturated atmosphere and high gravity, which increases from its lowest point of 'a hundred and ninety or so[...] to four hundred, and then to six, and then further' (p. 154). In appearance, the planet resembles 'a pie plate with a slight bulge in the centre', with 'a polar diameter of less than twenty thousand miles compared to an equitorial one of some forty-eight thousand' (pp. 158-59). Equipped with numerous pairs of pincers, cylindrical in shape, 'a foot and a half long and two inches in diameter' (p. 44), the Mesklinites '“walk” by rippling forward caterpillar style' (p.175). The novel begins with a pact between Barlennan, captain of the Mesklin trader ship the Bree, and a scientific survey team from a future Earth having already been forged. Central to the denoument of the novel, the reason why the Mesklinites agree to help the visitors from Earth turns out to be have been expressed with deliberate ambiguity by the author rather than signifying an absence of a credible motive on the part of the former: 'that strange being had persuaded him to remain for the winter, and had somehow done it without promising any protection to ship or crew' (p. 6). The visitors from Earth are referred to by the Mesklinites as 'Flyers', a concept which the aliens have to have explained to them as a consequence of their understandable aversion to losing contact with the ground 'in an environment where a fall of six inches was usually fatally destructive even to the incredibly tough Mesklinite organism' (p. 23). The 'grave' mission of the novel's title refers to the survey team's attempt to overcome a barrier to their ambition 'to learn more about gravity[...] than anyone since Einstein' from the poles of Mesklin with their 'most terrific surface gravity of any spot in the Universe so far accessible' to them (pp. 48, 51). The help of the Mesklinites is enlisted by the scientists in order to attempt the recovery of a 'grounded research rocket, which had landed under remote control near Mesklin's south pole and had failed to take off after presumably recording its data' (p. 48). The Mesklinites' treacherous intentions are well sign-posted from early on in the work: '"But what sort of devices were on board this rocket?” Barlennan asked. He regretted the question almost in the same instant; the Flyer might wonder at such specific curiosity, and come to suspect the captain's true intentions' (p. 52). Barlennan's aspirations are easily discerned, but Clement feels it necessary to cue up the last third of the work with as plain an exposition of the captain's motives as you could wish to encounter: 'I think you know by now what I'm really hoping to get out of this trip; I want to learn everything I possibly can of the Flyers' science. That's why I want to get to that rocket of theirs near the Center; [they] said that it contained much of the most advanced scientific equipment they have. When we have that, there won't be a pirate afloat or ashore who'll be able to touch the Bree, and we'll have paid our last port dues' (p. 133). Barlennan explains his deception within the contexts of the universal attraction of the pursuit of knowledge, and the fact that the survey team overlooked the possibility that the natives of Mesklin may be just interested in outcomes of their research as the scientists themselves are: 'You had told me how badly you needed the knowledge; none of you appeared to think that I might want the same thing' (p. 196). At the end of the work, the Mesklinites' scientific aspirations do indeed take flight. 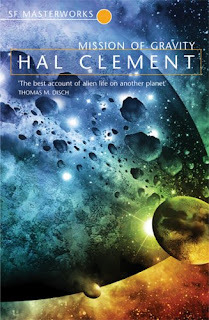 Set on a planet with a name like Mesklin, a reader approaching this novel for the first time may expect Clement's imaginary world to manifest hallucinatory qualities. For this reader at least, this was very much not the case. The unrelentingly linear plot of Mission of Gravity, with its here-comes-the-next-one chain of encounters with rock-rollers, river-dwellers and glider-makers does not make for a compelling speculative fiction narrative: 'From my point of view, this trip has been rather dull so far; the few encounters we have had have all terminated very tamely' (p. 151). Swap the methane oceans for the high seas and the Mesklin landscape for a polar one, and you have an adventure novel with with some theoretical physics lashed on to it, which to all intents and purposes is what Mission of Gravity resembles. I'm not even sure I'm going to call talking caterpillars 'science fiction'. Or perhaps that's where the mescaline comes in after all?